We are still working through Suzuki piano book 1, and I suppose it is fair to say that this could be considered slow progress. After 10 months we are nearly half way through! As far as Antonia was concerned, that’s partly because she took a lot of moments off to pursue her own musical ideas, improvising, sounding out tunes she knew and so on. I never wanted to push her to practice, so I figured if she was doing something on the piano, that was more than fine. Recently, she has put a spurt on. I consider her to be more musical than me. She can figure out most of the melodies just by listening to the CD. She doesn’t have as much music theory and reading background as me, which slows her down. She is starting to be frustrated by this, so we are tackling it. As for me, I could technically handle all the pieces in book 1 to start with – after a fashion. But I just had my moment of epiphany. Suddenly, something happened and I could play everything so much better. I don’t even know how to describe it, but its something to do with left and right hand coordination or independence or something. Because it’s so exciting for me, I’m no longer marking time on Book 1 to keep with Antonia, but zooming through it in excitement to get to Book 2. And I’ve also been realising that I am probably more musical than I ever gave myself credit for. I pretty much taught myself music and I’m afraid I miseducated myself by an overeliance on reading music. I was a brilliant reader very early on, and reading music was never an issue for me. Unfortunately it distracted me from listening, remembering, repeating and analysing pieces. I knew I wanted something more listening based for Antonia. In Suzuki, it’s important to listen to the pieces (on a CD), and to memorise them. The pieces are longer and more technical than is usually found in beginners methods. You do need to really work on them, especially if you are a genuine beginner, not a false one like me. Each one contains a new piece of technical – and musical – information. I also have the teacher’s guide. I kind of laughed when it said that children can usually play the pieces by ear before being taught them, and that they can play a basic accompaniment to an original piece without being taught explicitly. It seems like a small miracle to me that my daughter can acutally do this! She has absorbed the musical ideas and uses them in her own improvisations! As for me – I know I get no bragging rights for being very competent at the first half of Suzuki book 1. Lots of 5 year olds can do the same as me. But progress is progress so I am bragging anyway. Suzuki has renewed my hope of one day being a reasonably good piano player – especially when I look ahead to Book 2 and drool over the ‘real’ classical music in there. From time to time, I ask Antonia if there is anything in particular she would like to learn. Not too often, because her projects are usually quite ambitious! Two years ago, it was “learn all about science”. Last year, it was “write poetry and play the piano”. To some extent these things got done, though they are never-ending in a way. This year, she said: “This is sort of a joke, Mummy, so promise not to laugh too much” . I told her I wouldn’t laugh. I still did not laugh. I was impressed! This is yet another side effect of that history-readiness that kicked in. A whole new vista of human life is opening before her. The other big change this year is that she is going to spend all Wednesday at, well, … it’s kind of a day camp for Wednesdays. French kids don’t have school on Wednesdays, but their parents usually work, so… there is a thriving Wednesday activity culture. When we started homeschooling, we had seen this as a potential solution to the socialisation issue. It has to be said that few kids are available in the week time, and as they get older it gets worse. Until recently, Antonia was not happy around groups of children, but it seems she enjoyed her three days of day camp last week and is ready for some more. There are pros and cons of course. She comes home very tired and very late, but she gets a big dose of socialising in. It’s a regular commitment that inevitably limits other possibilities. Since I’m starting some studying again, it’s handy for me, except I would like to make sure that the errands all get done on that day. We will see how it works out for the autumn term. There are all kinds of these Wednesday camps, but we deliberately chose one which is very free and easy-going. There are small groups and activities are offered, but not compulsory. If the kids want to just play, they can. Our expectation is that it will be like a playdate, supervised by babysitters. We shall see. This is such a common flower round here, you would think I would know it. The problem is, the plant is very variable and I hadn’t assumed they were one species. Sometimes these flowers have a tiny purple flower in the centre, and sometimes they don’t. Nobody knows why. Sometimes they grow in groups, sometimes alone. It’s mostly when they grow in groups that I notice them making that characteristic bird’s nest as they go to seed. What is bothering me is that the ones that grow in groups, that I notice ‘bird-nesting’ never seem have the little purple flower. They are typically later in the year. The one’s with the flower tend to grow alone. They started much earlier than the group ones, though they are still around. Anyway, I am now convinced that they are usually given the same name. 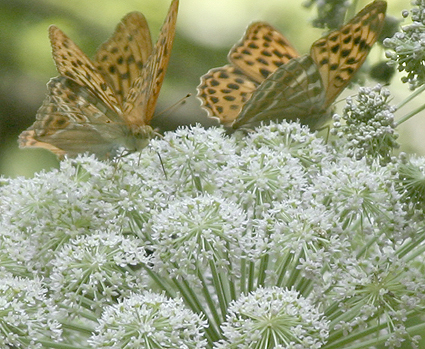 Queen Anne’s Lace is naturalised in North America, and I think it sometimes considered a pest. You can eat the roots, if you want – that might get rid of it! A few specimens of this flower in a particular spot each year, down by favourite stream. I think it can generally be found along the streams around here, but it is not extremely common. It is a beautiful mass of butterflies and other pollinators. And it grows taller than me, about 2m. 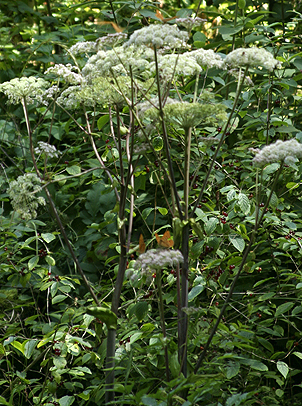 I do not know if Angelica Sylvestris grows outside of Europe, but I did discover that there is a very poisonous plant called Water Hellebore that looks a bit like this Angelica, and grows in North America. Apparently, you should avoid even touching it. This Wild Angelica is supposed to be edible, but sadly, it is not the garden Angelica whose stems are candied for cakes and things. I wouldn’t harvest this anyway. I don’t see enough of them around. Whew! I’ve just been reading the latest Charlotte Mason blog carnival, which is all about planning and scheduling. I am so impressed, overawed, in fact. I am almost surprised that nobody is using an actual project manager to plan out their kids’ education. I was halfway through reading when I felt prompted to post our actual schedule below. Then I realised that there is a difference between describing what you do and how you arrive at that. So I thought I would try again. The way I set about homeschooling is almost more Charlotte Mason than what we actually do. I have a principle, towards which I am tending, and it automatically directs my actions. I have an idea of the educated adult that I would like to help my daughter become. That applies to knowledge, skills, habits, character and so on. I don’t usually find it difficult to see what my daughter could/should work on next. Sometimes it is fiddly to find the right resource or method, to judge whether the moment is precisely right for something or how long it might take. For example, I feel a study of history is important, but I waited a long time to introduce it, and made a number of trial attempts, before she proved to be ready for it. I don’t plan actual content in the sense of deciding that we will study say ‘forests’, ‘magnets’ and ‘ancient Greece’. Themes and content seem to arise spontaneously, and I make no particular efforts to plan or control them, other than finding the resources at the right moment. At the moment we seem to be entering a ‘seas and oceans’ theme. My mind is gravitating towards the various novels, poems, documentary films and other resources we might have concerning the sea, and entertaining the possibilities of boating trips. But there is no plan that says we will have read x by Christmas. My principle doesn’t demand that specific content areas have to be covered at specific times, only that our daughter should have a broad basis of knowledge by the time she is in her teens. My second big principle has to do with how I think a child’s daily life is best spent. I don’t necessarily think exactly the same lifestyle is best for all children, but I try to find the best one for my daughter. There is a certain balance between structure and free time, work and play, attention to things that have to be done, time in which you have to think of your own activity by yourself, social time and outdoor time, quiet time and family time…. that works for us. The amount and type of ‘school’ she does has as much to do with what I consider to be the optimum lifestyle for her, as with what I think she needs to learn. I find that with those two principles in front of me, I don’t have to do an awful lot of planning as such. I do spend time thinking about and refining my principles, and obviously, as she gets older, the ‘ideal daily life’ changes anyway. I do tweak what we do accordingly. I do record things so that I see what really is happening, and what content is getting covered. But otherwise, I more or less make it up as I go along. Math: I give a short presentation of the work to be done, she does it, then we go over any issues. If there is something really new to learn, then we may work together for the whole session – 30 minutes. During this time, I do the housework! That is a total of one hour, and then there is a break! History or any non-fiction in French, read by her + narration + follow-up depending on interest – we do Story of the World in History on 2 days and are currently doing a book called La Mer in French on the other 2 days – 15- 20 minutes or more depending on interest. Journalling in English, occasionally a letter instead: any subject or story she likes, or I will suggest one – about 20 minutes. There is some more reading that gets done in the day, and even on non-school days. But there is not a fixed time for it. Before lunch, after lunch or even at bedtime, are all good times. 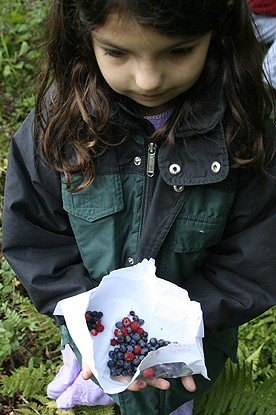 We generally go out in the afternoon for a nature walk, a field trip, an activity, errand or to play with other kids. But if it’s raining, we might cook or do an art or craft project or play board games. Piano practice – 15 to 20 minutes. Once a week this is a more extended music lesson, in which we study reading music and new piano material. French writing exercise – this sounds really schoolish and should perhaps be in the first part of our day, but she usually doesn’t have the energy – 10 to infinity minutes depending on energy level. I think it needs to be done though. During this time, I have my bath! Apart from that there is an extended art study once a week, which is a bit eclectic. It might be picture study with narration and copying. It might be GeeGuides. How long it takes is rather variable. There is also Chinese which often consists of listening to the CD in the car, but every so often, we need to sit down and do something a little more precise. Other educational things go on all the time, but these are the ones we pay conscious attention to. Antonia chose to go to summer camp for 3 days this week, and this was the first. Of course, I have a whole bunch of ambitions for my 3-day break: clean the floors so you could eat off them, finish my translation, indulge in some intellectual pursuits… However, Mike got hold of me and we spent half the day in necessary financio-administrative stuff. Tomorrow, we are going out for lunch together all by ourselves. Anyhow, it seems that Antonia had a good time today. She got home in time to have a bath, eat, and go to bed. This is the first night she has wanted to sleep in our bed for months. I guess she feels she didn’t get her parent time. I kind of have mixed feelings about the summer camp – I would hate her to decide she wanted to go to school, because I think educationally and socially it is not a great thing. On the other hand, I would be happy for her to spend more time with groups of children, if it can be reasonably free play orientated. One of the ways I work is to try to establish habits of doing certain things, rather than having lessons per se. So we have a habit of reading, a habit of drawing and now I am helping Antonia establish a habit of writing. Before I go any further, I should say that ‘lessons’ were a pre-requisite to this habit. On the other hand lessons do get in the way of living habits, so a balance has to be found. In Antonia’s kindergarten year we regularly spent 10 minutes a day on handwriting practice. Last year, we got the most common spelling words down, though we crammed this into about 6 weeks and did it orally. Now Antonia can pretty much write, not perfectly, but well enough, at least in English. The lessons aren’t over, because we’re going to start touch-typing as soon as I think it will reasonably fit in our schedule (maybe when her multiplication tables are all done, which will be soon). “There was once a little dog. She liked her bone. There was also a fox who liked bones. One night the fox stole her bone. In the morning she wanted her bone. She saw that her bone was gone! It was lucky she had another bone. The next night the fox came again! He stole the second bone! It was a trap. The dog bounced onto the fox. The fox ran away. The next day the fox stole all her forty-five bones. She was very sad. A wasp nest is under my garden steps. I do not know how it got there! Should I ask them? Maybe not. Egypt is a nice place. I like the Sphinx. The Sphinx is bigger than you. It is there to scare people off pyramids. Its body looks like a lion. Its head looks like a pharoah’s head. I homeschool. My Mummy homeschools me. I learn several things in a day. My Mummy does not always help me. I am not sure that that last sentence is not a reproach! There can’t be many things more fun than going into a freezing cold skating rink on a hot August day. Skating was one of Antonia’s educational disasters, and it’s taken her this long to get back into it. I was glad to see that she at least remembered all that she had managed to learn. She took skating classes over a year ago, and started out with great enthusiasm having waited (and skated with us) for several years. Sadly the class did not suit her at all. The teacher barked at the children constantly, but thought it would make her class fun if she introduced competitive games. Antonia skated more and more stiffly and defensively. The last nail in the coffin was when we realised that the whole of the final term would be spent preparing for a huge show. I couldn’t imagine our daughter performing at all in front of several hundred people. If anything went wrong at all, I suspect she would freeze or collapse in hysterics. In any case we weren’t interested in her having that kind of learning experience. We rather hoped she would learn to skate, and it became clear that learning was over for the year, and repetition was about to set in. Worse still, the teachers didn’t have the show planned out, and they spent the first couple of lessons in a huddle in a corner of the rink. Left with not much to do and a tiny area in which to do it, the kids resorted to the type of entertainment we so often find in playgrounds, for the same reasons: teasing, forming of cliques and physical violence. We quit at that point. I hope we get to go skating again soon, because I have always enjoyed it. Today was one of those days where my nearest and dearest seemed determined to aggravate me so it was lucky that we found a nice patch of wild blueberries so that I could have something nice to talk about. Also I found a fortuitous envelope in my pocket to put them in. To really get the effect, you have to imagine them both saying stuff like that at once, without any regard to the fact that the other is speaking! They do not always go on like that all day, I promise. If they did, I think I would divorce one and send the other to school. They are both just overtired. Now, I am overtired from listening to them. 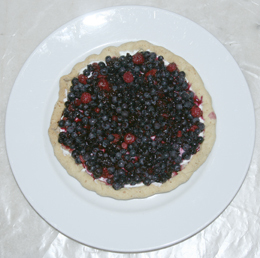 I did make the tart though, and it was delicious. This week, I identified two of the smaller white flowers that are very common around here at the moment, at an altitude slightly above our house. These are called Eyebright or Euphrasia, and the only thing I knew about them till now is that I see them every year and they look like pretty little faces. They are very small. Now I know that there are many kinds, and all the ones in my field guide are virtually indistinguishable. They are semi-parasitic on grasses, so I seem to be making a thing of parasitic and semi-parasitic plants just now. I had no idea until recently that such things existed. 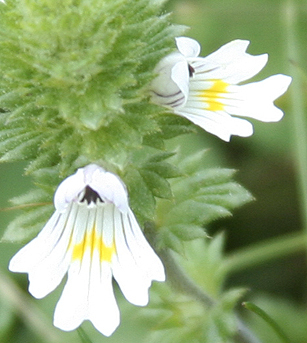 They have been used in various herbal medicines. They seem to prefer colder parts of the northern hemisphere, and highish altitudes where I live. 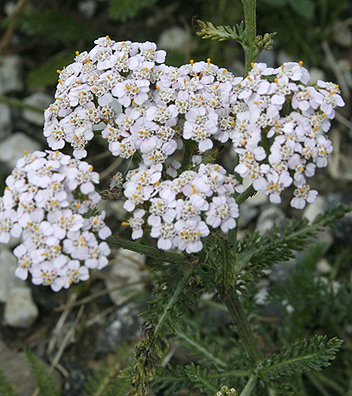 This is Yarrow, and I know from observation that the petals vary from white to slightly pink, also the little clusters in the centre, that I suppose are the real flower can be larger or smaller, depending on the plant. 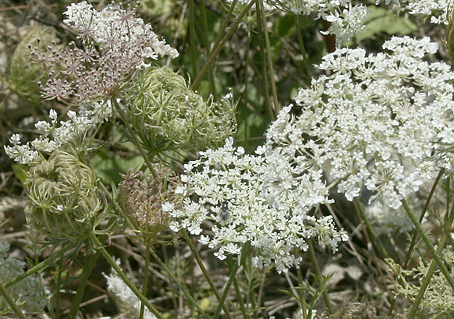 The Yarrow is easy to recognise because of the feathery leaves. It is/was also a medicinal plant. I also added Wood Sorrel to my list of known species because I suddenly remembered its name while the trefoil leaves were staring me in the face. It flowers much earlier than this, with yellow flowers, but the leaves are easy to recognise: There are three of them, but they are more heart-shaped than clover, a fresher green, and live in the shade of the woods.